I'm using an horizontal progress bar in my Android application, and I want to change its progress color (which is Yellow by default). How can I do it using code (not XML)? If progressBar is indeterminate then use getIndeterminateDrawable() instead of getProgressDrawable(). 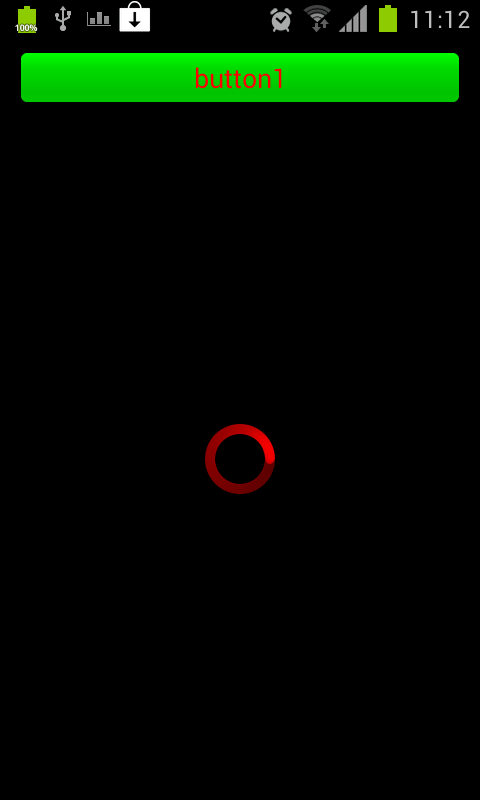 For my indeterminate progressbar (spinner) I just set a color filter on the drawable. Works great and just one line. This is an old question, but using theme is not mentioned here. If your default theme is using AppCompat, your ProgressBar's color will be colorAccent you have defined. So you are just changing a colorAccent for your particular ProgressBar. as per some of the suggestions, you CAN specify a shape and clipdrawable with a colour, then set it. I have this working programatically. This is how I do it..
First make sure you import the drawable library..
For bonus points, it doesn't use any deprecated code. Try it! If your theme is inheriting from Theme.AppCompat, ProgressBar will assume the color you defined as "colorAccent" in your theme. ..will tint the color of the ProgressBar automagically to the @color/custom_color . THis is what i did. Worked. Here use gradient to change colour as you like. 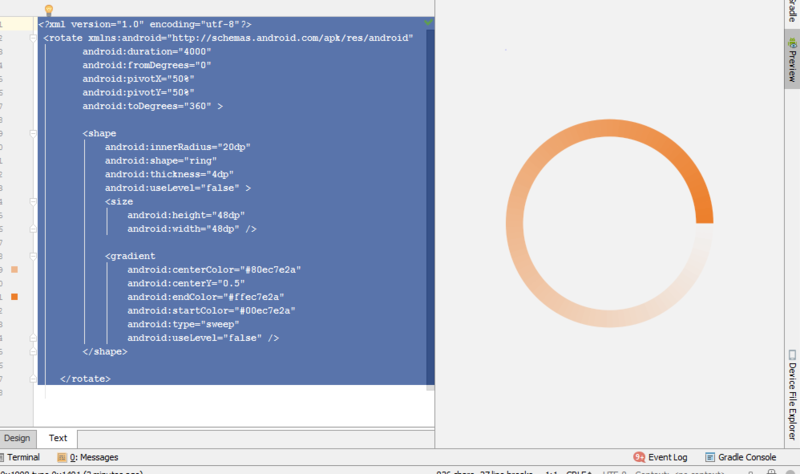 And android:toDegrees="X" increse the value of X and progressbar rotate fast. Decrease and it rotate slow.Customize according to your needs. It's sad that Android is such a mess! Simplest Solution if you want to change the colour in the layout xml file, use the below code and use indeterminateTint property for your desired color. I can say that there is (or at least was, at the time of writing when I looked at that current version of Android source code) a bug/issue/optimisation in the ProgressBar code that ignores an attempt to set the progress to a value it is already at. i.e. if progress = 45, and you try to set it to 45, the code will do nothing, and will not redraw the progress. After calling ProgressBar.setProgressDrawable(), your progress bar will be blank (because you changed the drawable part). This means you need to set the progress, and redraw it. But if you just set the progress to a preserved value, it will do nothing. You must set it to 0 first, then to the "old" value again, and the bar will redraw. As far as HappyEngineer's solution, I think it was a similar workaround, to manually set the "progress" offset. In either case, the above code should work for you. //if you require other gradient directions eg LEFT_RIGHT. //Copy the existing ProgressDrawable bounds to the new one. If you don't need the 'secondary progress' simply set value2 to value1. Apply this custom style to the progress bar. Use this type of image for progress bar. in XML Works for me, is easy enough. Here is the code for changing the color of ProgressBar by programatically. Note that order of drawable layers is important while initializing LayerDrawable. First drawable should be for background. As per my experiment switching ids does not work. If you set padding to progressbar then this approach will not work. If you need padding then you can use a container for the progressbar such as a LinearLayout. To change color of background and progress of horizontal progress bar. Not the answer you're looking for? Browse other questions tagged android android-progressbar or ask your own question. How to change default color of progress bar? how to change ProgressBar color? How to change the color of an indefinite ProgressBar? Is there a black progress bar to be visible on a white background?